Story originally appeared on TheRacingBiz.com (The Racing Biz). Outbacker is along in time in the Maryland Million Starter Handicap. Photo by Jim McCue, Maryland Jockey Club. Larry Reed has been involved in racing for a long time. A really long time. “I run horses since I was a kid. I bought my first horse for $180 at Charles Town in 1958. I was 18 years old,” Reed said, laughing as he reflected on how much time had passed. At 73, Reed has plenty of stories to share about a career that spans more than five decades as an owner and trainer. If Reed were to write this story, it would simply boil down to the last thing he said in an interview this week. The man, of course, is Reed, and the horse is Outbacker. 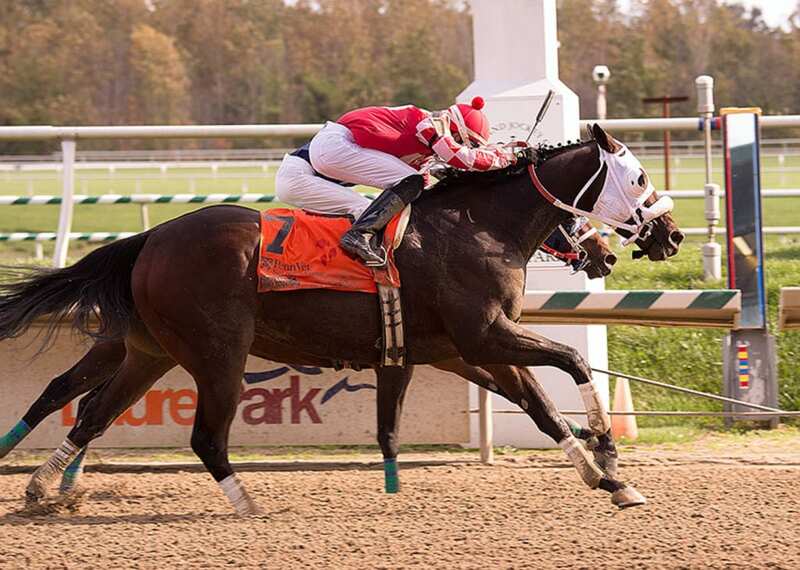 Outbacker won the $50,000 Maryland Million Starter Handicap on Saturday at Laurel Park, rallying from ninth midway through the mile-long race to nail The Camden Comet at the wire. It was another 5 1/2 lengths back to Q’s Jack in third. What was even more exciting for Reed was that the victory was his first ever stakes win in Maryland. These days, it’s rare for him to even race horses in Maryland (Outbacker is the only horse he’s run in the state this year), given the fact that he’s a one-man show who still operates a full-time farm and training center near Mountaineer Racetrack in West Virginia. Outbacker, a gelded son of Outflanker bred by Bonita Farm out of the unraced Irish River mare Norelands, was one of those horses. Reed claimed him for $12,500 in February at Laurel. The horse finished fourth in that race and hadn’t won his prior half-dozen races either. But Reed said he “gave him 90 days off and got him right.” Outbacker came back to the races at Mountaineer and then at Thistledown Racetrack in Ohio. In six starts following the claim, he won three races and finished second in the other three races. While Outbacker progressed, Reed kept an eye on the condition book at Laurel, with an eye toward October 18. That was Maryland Million Day and Reed had his fingers crossed. In fact, he’d been dreaming about Maryland Million Day since the day he claimed Outbacker. The Maryland Million Starter Handicap is open to horses that had run for a claiming price of $12,500 or less in the last year. Additionally, Maryland Million races are restricted to progeny of nominated stallions standing in Maryland. That meant that Outbacker wouldn’t have to face some of the tough out-of-state shippers who had previously beaten him in claiming races at Laurel. That made it, said Reed, an ideal spot for his charge. Once the field had drawn for Saturday’s race, it was Outbacker who was the high weight in the field of 13, carrying 120 pounds, one more than Lunar Rock. The odds board reflected faith in the horse’s form since Reed claimed him, and Outbacker went off as the 2.40-1 favorite. The victory may have been by the slimmest of margins, but was no doubt one of the biggest of Reed’s career. “I had friends riding him from the 3/8ths pole to the wire,” said Reed, with a laugh. It’s horses like Outbacker and races like Saturday’s that bring men back to the unrestrained joy and elation they felt while watching racing as children. On paper, it might’ve only been a $50,000 race at Laurel Park but, for Reed, it was the culmination of years of hard work. This is what he’d always dreamed of growing up on a dairy farm where his family kept horses, to buying that first racehorse at Charles Town and all through those years of searching for that one special horse. If Reed is nothing else, he’s humble. He gives just as much credit, if not more, to Maryland Million for including starter races in the program. It not only resulted in a special memory for him but Reed said it also sends a positive message to young fans and prospective owners.